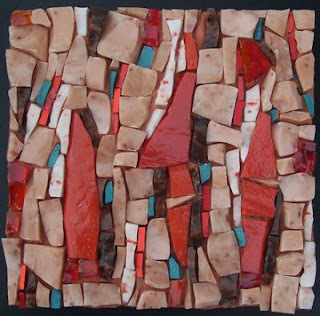 Margo Anton's Mosaic a Day: "Columnae Arantium"
The color on this photo is a bit off, and it just refused to be fixed. The whole thing is a bit more orange than you see--it's a little too red in this photo. Having said that, I really like how this piece turned out, I had a great time making it, and really, isn't that the point of the whole thing?